Post Your Steel Race Bikes! Way past it's racing era, but that's what it was built for in the day. Does this count? I never raced it as it was a lil winter project of mine. Its so sweet, not THAT heavy at 23 pounds. I may race it in our club races for fun this year, it will be my training bike however. It was my goal to keep it as classic as possible, but I had the fork sitting around doing nothing so I put it to use. That hardly justifies such a depressing display. Does anyone currently race on steel? That's what I should've asked. And before you say it's impossible there is a fast racer on my team on an older Colnago who does just fine. I thought waterrockets was the omega man when came to racing on steel. edit: wanders beet me to it. While you're all at it, please post your 1970's era Ford Pintos and Chevy Vegas. This is my current race rig - it is some kind of high tech alloy steel so purists may scoff, but it still counts as steel right? The ones you sold or any that didn't burn up? I sold my porsche, my MB, my BMW, my Mazda RX-7, etc. I have never owned a Vega, a Pinto or a Gremlin. Photos are before I got the PowerTap, so I'm down to 32 spokes on the rear now. Last edited by waterrockets; 04-04-08 at 08:33 PM. Are those the wheels you raced on, too? It holds up its end of the bargain; just wish I could say the same. ^Is that a bike pump on rear stay? No cO2? You think a guy who rides an 8-year-old bike is going to pay for air? EDIT: those are 26mm bars, and a 9-spd drive train too. 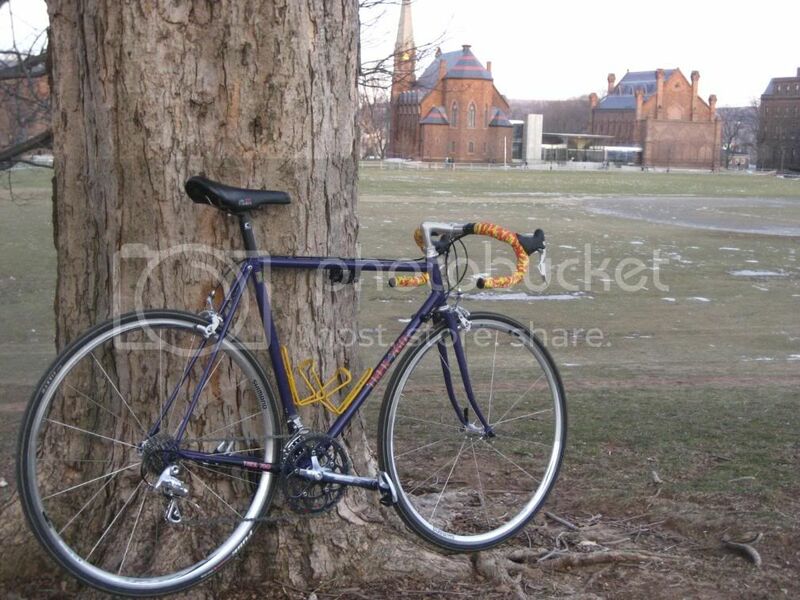 Look classics, Performance Forte' saddle, $20 tires... shall I go on? Last edited by waterrockets; 04-04-08 at 09:00 PM. That's an extremely steep head-tube angle! 1984 Trek 760 frame with Campy centaur and veloce mix, with shimano wheelset, cassette, and chain. On CDR's advice, I'm trying out the saddle and seatpost from my 'good' bike on this (it doesn't fit right). So in its 'race ready rig' for the weekend, it's got a set of 1600 gram neuvations and Cannondale carbon wrapped seatpost with an SLR saddle. The saddle has been raised a bit since that picture was taken. This is the only bike I've ever raced. I'll probably get around to racing my CAAD9 once I get a bigger frame so it fits, but till then I'm pretty okay with racing this. I might get around to buying a carbon fork for it at some point at some point of time, but I don't really know of any reasonably light/inexpensive carbon forks with an alloy or full carbon steered. I found one at performance bike, but I'm not sure if it's fully compatible. I might have gone for it this past weekend if I knew what I was looking for. 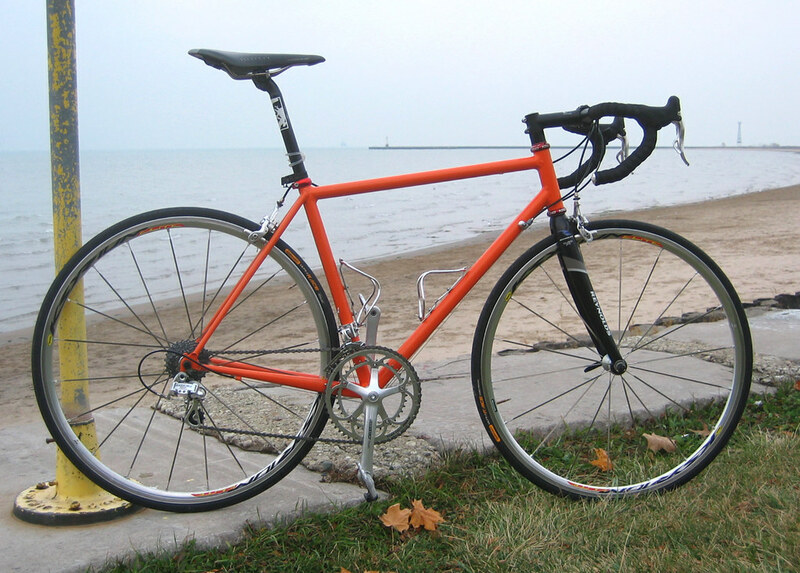 The bike would be down to about 18-20 lbs depending on fork picked and which wheels I decided to put on it. I'm hoping to do that at some point of time, but at this point of time I'd rather save up for a powertap because that will give definite performance gains instead of a one time weight drop. Waterrockets, what fork are you running on your bike? Is it 1'' steered? 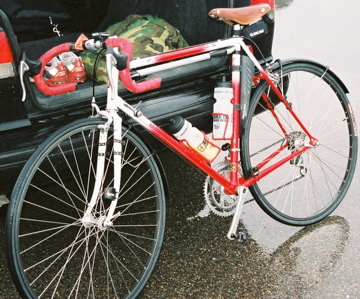 This bike is my bad weather race bike and all year training bike. So carbon fork might not be needed since the weight transition to the lighter race bike would give a mental edge. Sorry about my rambling, but I love the bike! Yeah, that's a really nice looking ride. How did that section heading west towards the line near the end feel on steel? I was on carbon and that section beat me up. I lost one bottle and a couple of tooth fillings, and I don't even have cavities. Whatever $70 fork nashbar was selling at the time. Yeah, 1" AL steerer. I think tire pressure has more to do with it than anything else. I was running 105 psi rear and 95 psi front, at 178 lbs. That final stretch was pretty bad, but every time I went through there, I was off the front or bridging, so I didn't really think about it much. Last edited by waterrockets; 04-04-08 at 09:59 PM. So it is the engine. Waterrockets is a stud. That is some TT rig. You ride those wheels in a TT?